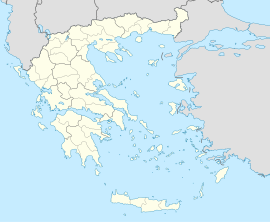 For other uses, see Vasiliki (disambiguation). Vasiliki (Greek: Βασιλική, Vasilikí; formerly Voivoida (Βοϊβόδα, Voïvóda) is a town in the municipal unit of Apollonioi, on the island of Lefkada, Greece. It is situated on the south coast, 4 km south of Agios Petros and 25 km southwest of Lefkada (city). Vasiliki is a well known windsurfing spot during the summer months due to a local thermal wind known amongst windsurfers as 'Eric'. There are often over a hundred windsurfers in the bay at any one time. The area is also popular with other sailing craft and mountain bikers. Several holiday companies operate in Vasiliki providing windsurfing and sailing equipment for their guests to use. This page was last edited on 27 September 2018, at 14:09 (UTC).